My first Big Muff was a green Sovtek with the unmistakable bubble font. I bought it new in 1996 and was instantly blown away, quite literally, by its huge tone. Itâ€™s still one of my all time favourite pedals so when Electro Harmonix announced a new reissue, I had to check it out. Hereâ€™s my review of the Green Russian Big Muff. David Gilmour has been using Big Muffs since 1976 and the recording of Pink Floydâ€™s Animals. The ramâ€™s head model defined his tones in the late 70s and early 80s. By 1994 and the Pulse tour, David had swapped the old ramâ€™s head for an early 90s Sovtek â€œCivil Warâ€. The so-called Civil War Big Muff was soon followed by slightly different versions in green and black boxes. What defined these Sovtek Big Muffs, apart from their cold-war Russian appearance, was their massive low end, smooth overdrive-like gain and noticeably more mid range than the 70s models. The Sovtek Big Muffs hit the market just as the grunge bands started to appear. Most of these band wanted those old analog and vintage pedals and not the digital stuff of the 80s. In a way, although perhaps a bit simplified, the Sovtek Big Muffs started the whole reissue and clone boom. The Green Russian Big Muff is a brand new circuit based on the tall font (design of the original logo) green Sovtek, which is very close to a Civil War model. Itâ€™s got that tight low end and a hint of mid range. The tone is unmistakable and probably as close as you can get to the originals. I guess you can say itâ€™s about time that Electro Harmonix did a proper reissue of their old Big Muffs. They have a wast range of different models available but none of them really sound like the ones from the 70s nor the 90s. Still, I can appreciate the fact that they want to evolve and maybe offer new and modern versions to new generations of guitarists. But, the Big Muff belong with Electro Harmonix and I think itâ€™s very cool to see that they now properly embrace their own Big Muff legacy. What I like about the Green Russian, apart from the small foot print, true bypass and led, which are all considerable upgrades, is the fact that like the original, there are no bad tones. You can pretty much set the controls randomly and you get something great. Crank the tone control all the way up and the low end is nicely retained. Roll the tone back past noon and the mid range gets more present. With the gain all the way up youâ€™re instantly in Gilmour territory. Roll the gain back to noon or even lower and you got a nice and warm overdrive pedal, with impressive clarity and response. I think the pedal sound best with the volume control around noon or slightly above but try boosting it to around 75% and you get a nice smooth tone, with a bit of boost for your amp as well. Roll back the volume slightly below unity for even more of those creamy fuzz harmonics. Paired with a Hiwatt or similar mid range oriented amps, I did the review on my Reeves Custom 50, the Green Russian sound smooth and cuts through any band mix. It doesnâ€™t really need to be paired with anything else, although slight clean boost or transparent overdrive will bring out even more of its character. Big Muffs can be a challenge on the more scooped amps and bedroom setups, but the Green Russian fits pretty much anything with its slightly boosted mid range and fat low end. So whatâ€™s the verdict? Iâ€™m honestly impressed and both surprised and glad. As much as I love many of the clones out there itâ€™s good to see the classic Big Muff back home where it belong and for the affordable price you really canâ€™t beat the value and tone youâ€™re getting. Definitely worth checking out! Amazing playing, feel and tone as usual! Can you please share your settings on the e-lady and delay, that you used for the Comfortably numb solo? Thanks! Thanks! The delay is set for time settings seen on the screen, 7 repeats and moderate volume/level. Read more about the E-Lady here http://www.gilmourish.com/?page_id=80? First of all, thank you for your incredible work! I have a question… for a similar tone to live in gdansk, which would better? green russian vs big muff triangle? The Green Russian I guess. It has a bit more mids and compression that sounds similar to David’s more recent Muff tones. Keep in mind though that Big Muffs often need an amp that can handle those kinds of pedals. More on that here. You say the Green Russian sounds best with the volume at 50%-75%. That’s way above unity (at least with the drive at 100%). How would you deal with that on a practical level in a live situation ? ( I haven’t played much live YET.. so forgive me my newbie question:) – I’m wondering if you would set up all of your drive pedals to unity with the Green Russian being way above unity, in order for all of them to be at a similar volume? Get my point? .. Thanks! ps.just ordered the e-lady as well ;-P … you’re making me poor, Hahahaha! Oh – and I don’t know if you saw the “That Pedal Show” episode, where they compare Colorsound Powerbooster Clones?? They are giving BIG kudos to you “Bjorn’s been saying it ALL along – why didn’t we listen! ?” X-D Sooo funny! You rock! Thanks SO much for this site!! Volume depends on how you’ll be using the pedal, with what amp and pickups and obviously what tones you want. I like my drive pedals to be a bit cranked to get a smoother compression going. A good place to start is around unity and tweakthe volume a bit and hear how that effects your overall tone. Cheers! Nevermind :) … Hope you’re having fun! Good to hear you’re busy doing what you love;) … Thanks for the answer – very interesting concept. I’ll surely experiment with that. Have you ever tried the Suhr Riot pedal by the way? No I haven’t. Need to one day! Hi Bjorn, Merry Christmas! I would like to know what setting you recommend to use BD2 and the Green Big Muff EHX for David Gilmour tones. Thanks hugs! Depends on your amp, amp settings and pickups. In general I would start with setting the GR with the volume slightly above unity, tone somewhere around noon and the gain around 75%. Add the BD-2 with a slight volume boost, tone around 8-9 o’clock and the gain fairly low. The fine tuning depends on your amp and pickups and what tones you want. You want the BD2 to add flavour and EQ and not so much volume and gain. what sort of line up would you recommend for me, for a real good tone (doesn’t have to be specifically precise)? love your work, i got almost all pedals from your recommendations! Not sure if I understand your question… you mean your pedal order? It looks fine. You may want to try that BD2 after the Muff if you use them together but it depends on what tones you’re looking for. I really like your web and your videos, I bought this pedal based on your reviews and I have to say im impressed. I had the tone wicker but didnt get the sounds I wanted, now im really happy, the green muff sounds amazing with my tele and my legacy. Cheers from Argentina. Hey man – how would you compare this to the Pete Cornish P-2? I definitely feel the P-2 has more mids and is not as scooped as many muff variants. Thanks! I haven’t done an A/B so I can’t really tell but from memory alone I would say that the P2 perhaps a bit brighter and it has more gain. What is your opinion on the new EHX reissued Triangle Big Muff for Gilmour tones? I’m debating between buying the Green Russian and the new Triangle. You’ll find review of both here on the site. hi Bjorn ! im looking to buy a new fuzz. I’m stuck between the absolutly analog green russian or the EH green russian but i don’t know witch one to get. could you help me ? thanks ! The EHX Green Russian is fantastic. in your opinion the ELECTRO HARMONIX mod. GREEN RUSSIAN BIG MUFF (new edition) is good for PIGS THREE DIFFERENT ONES solo ? ELECTRO HARMONIX mod. 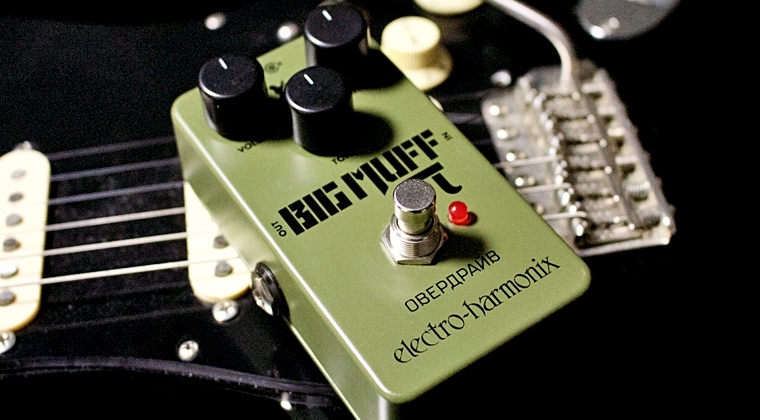 GREEN RUSSIAN BIG MUFF (new edition) is good equalized or does it necessarily need to be boosted ? do you know if the B.Y.O.C. mod. THE LI’L BEAVER TRIANGLE and the B.Y.O.C. mod. LARGE BEAVER must be BOOSTED ? in your opinion this products is good equalized or does it necessarily need to be boosted ? Does ELECTRO HARMONIX mod. GREEN RUSSIAN (new edition) it has a impressive bass ? I’ve tried to explain its character in the review but yes, it has a lot of low end. Not too much but more than most Muffs out there. Again, depends on your amp, guitar and taste but compared to the Green Russian, these two often sound better with some boost to get a smoother top end. Depends on your amp, pickups and taste but personally I think it sounds best alone. Very, Very, Very, Very THANK’S FOR ALL !!!!! I have seen your review of the JHS Muffuletta , in your opinion is it a decent clone of the green Russian ? Yes but I think the EHX Green Russian reissue is better. Literally? Sorry to hear it. Hope you weren’t injured, and that you found your way back home. I hesitated between Green Russian and the Patriot but I feel that the first is a better choice because of the price. The question may already be asked but, apart from the price, the 2 pedals are they comparable? The Patriot is slight darker and it has a bit more low end but other than that they’re pretty similar. The tele is a rare one, its a 60s reissue with a rosewood laminated body. Very pretty guitar and great sounding. Hope you like it. Thanks for keeping the reviews coming! Nice clip! He did swap around between the two but it’s hard to tell which is which just by listening. I’m searching for a Big Muff and I think I’ll buy this Green Russian, I’ve seen your video review and read about it, compared to the other EHX Big Muff and Op Amp this Green Russian seems to me more natural, well balanced and at the same time dirty in case of necessity, the other EHX Muff seems to me a little bit gated, however I’ll try, both the NYC Reissue and the Op Amp version. Does the Electro Harmonix has a more vintage type of fuzz, for earlier Gilmour tone?? I’ve seen the EHX Muff Overdrive, the Satisfaction Fuzz, the Double Muff and The Octavix: they all seem to refer to older models, what do you think about it?? Do you that one of this could be fine for more vintage tones (not only for Gilmour, maybe even for Hendrix or Robin Trower, for example)?? Thanks and sorry for my not perfect english. You should check out a fuzz pedal for authentic early Floyd fuzz tones. See the Buyer’s Guide for fuzz for some tips. But as you can hear in my review, I think the Green Russian does a pretty good Time tone. I have been following your website for many years and thank you for all your hard work and inspiration. I wanted to ask, is the green Russian also a suitable substitute for earlier Floyd like Meddle etc? And is it a good pedal through the clean channel of a Mesa Mark V head and 4 x12 cab or fender sonic head? One thing I seem to not have grasped is, does Gilmour specifically use an overdrive ONLY for rhythm nowadays and a muff for just leads? For example in TIME would he use an overdrive for the verse and then step on the muff or an overdrive all the way through and roll up the gtr volume for leads as it was with a fuzzface? Any advice would be kindly appreciated or links to your articles where this is answered. Fender-style amps doesn’t go as well with Muffs and Marhsall and Hiwatts. At least not for David’s tones. You’d need more compression and mid range to get that smooth tone. Check out this feature for more on how to choose the right pedals for your amp. The Muff is always used for leads but only for certain songs, like Comfortably Numb and Sorrow. Most of the time you’ll hear Tube Drivers set for different amount of gain. See the Live at Pompeii gear guide for more. I just picked one up and have been really enjoying it. So much so that i sold my dark side. I’m still experimenting, but i was just curious to hear how people are using them. Anyone boosting before or after? i’ve been boosting after with my blues driver at various settings but I’ve been going back and forth as to what sounds best. Truth be told the green russian sounds pretty good on its own with no boost. Anyone else want to share their preferred settings / experiences? I really anjoy it alone, without a booster but here’s the thing… There are no right or wrong with boosting or stacking. David always booster after. Boosting before is just like driving the front end of a tube amp. You basiclaly add more gain. Boosting after, adds more tone and volume, much like an EQ. Thank you for another great in-depth review. I am looking to buy a new muff to replace a 2000s NYC muff, in favor of something a little more pedalboard-friendly as well as closer to Gilmour’s tone. I had my eyes set on the Vick Audio 73 Ram’s Head (thanks in large part to your review), and I’m just wondering how you think this pedal compares to it. Which would you recommend? I have a Fender Strat and play through a Fender Blues Deluxe. The VA 73 really appealed to me because you said in the description that the demo was through a Fender Blues amp. Thank you again for all the hard work and dedication you put into this site, it is very helpful! This Green Russian is darker and smoother I guess and it does go nicely with the Deluxe. The Vick has a mid range switch allowing a bit more mid range for scooped amps. The Vick is brighter and more aggressive. I can’t say that one is better than the other because both will fit your amp but they do sound very different. I recommend that you also read this feature for some tips on choosing the right pedals for you amp. How much does this pedal weigh? Thanks! where you give the pedals a score for playability with drive, bedroom levels, faithfulness to different albums and eras and a total score, how would the numbers look for this one? Thank you and a Happy New Year! I’ll update these guides soon. I’d give the Green Russian a very high score throughout. I really dig it and they did a fantastic job recreating the original pedal. You can pretty much use for anything between Animals and Rattle That Lock but obviously, as David mainly used the Sovtek Muff for the 94 Division Bell/Pulse tour, that era would be most accurate. Hi Bjorn, Just saw your update on the Muff page and you’ve given her high marks; great timing as by co-incidence I had just ordered one earlier today! One question, what would you stack this with to get close to Animals and Wall tones? Thanks for all your great reviews. I think it sounds best alone, with the gain maxed but pairing it with a transparent booster like a Powerbooster clone, Boss BD2 or similar will make it smoother and more compressed for those vintage tones. You may need to back down the gain a tad. Got my GR and enjoying it immensely. Compact, great fit on my board. I’m getting good tones alone, stacked with a Powerbooster, OCD, and even with all three on. If I back the guitar volume down I get a nice clean lead sound where you would never suspect I was using a Muff. Great call. Glad to head that! How do you stack the ocd and the big muff? following your review, I decided to do a little Xmas shopping and I got the Green Russian. Fantastic pedal and unbeatable for the price! As you wrote, it is very versatile and you get a good tone whatever settings you use. Before, I used the Buffalo Patriot, although I had always found it difficult to tame and less versatile. Occasionally, I slightly boost (after) the Green Russian with the Buffalo Power Booster, but it works very well on its own. I also found that it works nicely with the other pedals. I normally use it with a Hiwatt T20 for Floyd stuff, but it sounds good on a Fender Blues Junior (Tweed with Cannabis Rex speaker) as well. Thanks again for you review! Hey BjÃ¸rn, I have a peavey valveking amp, I love the animals and the Wall guitar sound, do you think this pedal would best fit my desire or would something else work better. Thanks in advance. This website is amazing. I don’t really have that much experience with the Valveking. It’s typically Fender, which doesn’t go that well with Muffs but you can set the amp up for lots of different sounds. I guess I would have looked for something a bit more versatile, like a Rat or OCD, but between the different Muffs out there, the Green Russian should be one of the better companions for these amps. Hi BjÃ¸rn. Just ordered it. I have the little big muff, which I am quite satisfied with, however hard to dail in. I assume the Green Russian to be better? It always depends on your pickups and amp but having that in mind – yes, this one is more accurate towards David’s tones. Great review Bjorn! I’ve been reading the site since 2009 or so. Gilmourish introduced me to BYOC, and now all my overdrives, distortions and fuzzes are built from their kits. It just came out, and op-amp muffs are not really part of DG’s rig (as far as I know), But I’d love to see your review of the new EHX op-amp Muff when you get the chance. Thanks for the kind words! No, David’s never used the op-amp but you can easily set it up for some nice Gilmourish tones :) I’ll try to make a review. Hi Bjorn! Great job! I would like to buy a russian muff(actually i have pig hppf mkii, is amazing!) In you’re opinion what’s the best choice between: buffalo fx patriot, wren and cuff box of war and ehx green russian? I have a strat with d alle echoes pu! I think the Green Russian is hard to beat. The Patriot is very close, with a slightly darker tone and smoother top end, while the Green Russian has more sparkle and a tad more gain. You could go either way I guess. Hello Bjorn, inspiring as always! Is the pedal buffer friendly ( placed after a Boss pedal ) ? Yes, I haven’t had any issues with it. I’m looking to buy my first Big Muff and I want something that’s good at replicating the late 70’s and early 80’s tones (such as animals, the wall and the wall live) while being versatile enough to get somewhat close to the pulse tones. I’m on a tight budget, so the only muffs I can afford are this and the mooer triangle buff. Which one would you recommend? Thanks, I settled on the Laney head, with a vintage 30’s cab. The head has a wattage dial so I can set it up for bedroom/recording levels easily as well as 3 channels to setup for different genre’s. My 90’s big muff bit the dust today for some reason. Haven’t used it in a while so I thought it was the pots. I usually use a Tube works Tube Driver rack unit from the 80s. Currently with some old Conn 12au7 tubes, I have about 50 I pulled from an organ years ago. Original RCA clear tops, they just sound too smooth compared to newer tubes, with a Bad Monkey for boost. As for the Muff, I think I’ll order some mod kits and maybe Make a P1 or something out of it, while I break in the Green Russian I bought. Should be delivered in a few days. Love the site here, as well as your personal site. After almost 10 years reading here, I finally posted something. Thanks man and keep doing what you do!! Looking to get a new amp set up. What do you think the green russian through a Marshall dsl100 or Laney Ironheart irt120 with a Laney 4×12 and V30’s may sound like. I don’t always play Gilmour so, I’m trying to find common ground. I think you’ll find the Lionheart to be much more Gilmour than the Marshall. Muffs also tend to sound overly aggressive on Marshall, due to their increased mids and compression. Great review Bjorn! Loved the tone with the E-Lady Flanger. I had a BYOC Triangle Muff before that I loved on it’s own, but I always found if I tried to use it for a solo I would get a volume drop. I don’t have it anymore, but I think it might have had to do with the scooped mids. Have you ever experienced this? I’m wondering if the Russian with its different EQ might not do this? The Big Muff doesn’t have a lot of mid range so if you’re used to Tube Screamers, Rats etc and kick in a Muff, you will notice less presence. It’s not volume drop but it appears that way because your ears will perceive mid range as something louder. The Triangle Muff has the least amount of mids, while the Russian Sovteks, including the new EHX Green Russian reissue, has a bit more. There are Muffs, like the Vick Audio 73, that has a mids boost switch as well. How does the Big Muff compare to the Vick 1861 Civil War that came out last year? Very similar. The 1861 has a tad less low end and perhaps a smoother top end and it’s got the 3-way mid range switch. You could go either way but I guess the GR is slight more authentic towards the original. Hi Bjorn, great review as always. I would love to see you do a review of the Deluxe Big Muff. You can get so many different sounds from it, including this new Green Russian. I would like to see you try and replicate the sound of your favourite Muffs. I’m sure lots of other people would too. ok Bjorn, I have just posted on EHX Instagram asking them to do that. Fingers crossed. Hi Bjorn, did you tried the Green Muff with the Hughes & Kettner Tubemeister 18? How does it sound? It is my first time asking/commenting here, but I follow you for many years now (already lost the count). So, I want to say thank you for the immense work and keep going! Cheers! Thanks Jorge! I don’t have the HK anymore so I haven’t tried it but based on how the amp worked with other Big Muffs I’m confident that it sounds great! Mind though that I always used the gain channel with the gain backed almost all the way down. The clean channel has too much headroom for gain pedals. As always a great review! I mainly use AC30’s (all valve) and I read on your site that a Big Muff is not recommended for these amps. But do you think this new version can fit it nicely?? Keep up the good work and thanks for this amazing site!!! Thanks! By that I mean for David’s tones. There’s no reason why you can’t use Big Muffs with Vox or Fender amps, many guitarists do and have produces some legendary tones but for David’s tones, I’d go for either pedals with more mid range or, an amp with more mid range. Having said that, this Green has a bit more mid range than the 70s models so I guess it will be a better option than most. OCD or Rat maybe. They have the needed mid range. Pedals behave differently on different amps and what pedals you combine with it. 50% is about unity for me but adjust the volume control on your unit until it matches your setup and hear how that sound. There are no rules or ghospels when it comes to settings. Everything has to be adjust to fit the whole. I haven’t posted in a long time as I am no longer that interested in Gilmour’s tones even though I still kick it in when I play PF/Gilmourish stuff. My current tone is kinda like a LP plugged into Fender amps. Kinda like Bonamassa’s tone but with a Strat as I prefer the more layered texture single coils provide. Just wanted to say that I still frequently visit your site(s) and that I love Gilmourish and Bjornriis as simply just really good guitar sites. So thanks for the effort and work you put in Bjorn! Awsome!Thanks for the continued support and good luck with your playing! As always, great review Bjorn…! I still can’t dial any useable tone from the Vick’s 73, no matter where on the board. So, I’m leaning towards replacing it with this one since you mentioned any setting will sound good, and will work better w/slight midrange boost with Fender/Twin amps. Do I hear… “Yes, go for it”? Ha ha, well, as I’ve tried to stress on this page, Big Muffs can sound pretty nasty on the “wrong” amp. Especially if you’re looking for David’s tones. I wouldn’t recommend a Muff for a Twin unless you really want that tone but yes, I do think the Green would go better than most models. I also have an EHX Bass Big Muff. WOW, If I didn’t know better, I’d swear it was my Castledine V2! The sound is so close, I’d have a difficult time telling them apart. Very nice sounding pedal. Maybe Matthews has come out from under his rock, and decided to make some great vintage pedals again. It sure would be nice!!! Hi BjÃ¶rn, great review as always! Do you think the pedal will work well with a BD-2 and Laney Cub 12 (<1 watt input)? Thanks. Cheers! Hi bjorn, nice review. Do you know how can i improve the sound of my solid state amp? Ive got a fender mustang amp, a fender mexican strat and the boss bd2. i just cant get a killer tone out of this amp. Please help me! Thanks for the review Bjorn! Finally a true expert’s opinion. The pedal looks tempting but is it worth to buy if I already have Mojo Hand BMP-1? Yes. It’s always down to taste but I think this is much more accurate towards the original Sovteks. Awesome low end and mids. The Mojo BMP-1 is brighter with less low end and not as smooth as this one. Oh dear, I have a Bass Big Muff but I just know I am going to buy one of these. Or maybe a few as Christmas gifts. Hi Bjorn! Thanks for this review, as always! How would you rate this pedal out of 10? I would give it a 8 or 9. All of these ratings are purely subjective and there are other Muffs I would prefer over this but it sounds really great. I gotta ask, what are your top 3 non-vintage Muffs? Patriot? Vick 73 Ram? Also, great review as always. At $80 US, I might have to snag one of these just for the hell of it! My old green Sovtek bubble font is probably my favourite but I guess you’d consider that as vintage. I have to say too that this EHX reissue is right up there. Thank you! I’ve always wondered and I value your opinion. Cheers! Thanks again – How do you find it compares tonally with the Skreddy Pedals Rust Rod? Pretty similar although the Rust Rod is considerably louder and it has a bit more gain. Green russian big muff vs de luxe big muff? Depends on what you’re looking for. The Deluxe is obviously more versatile but I think the green is no doubt more authentic towards the original Sovteks. Thank you for the reply. in fact I do not really look for the “russian” sound, but to cover most of the tracks where David uses the “big muff”. I have both pedals (de luxe & green russian). with the green russian I can hear the attack and the strings playing, while with the de luxe no. do you think that with the green big muff I can do all the songs of Pink Floyd and Gilmour or do I have the de luxe too? sorry for the bad English. I think the Green is fully capable of covering all of David’s Muff stuff. I have decided to follow your advice (all ..) and I must say that I was really happy and wanted to thank you. I removed the ts-9 and the De luxe big muff and I kept the green russian big muff (fantastic). Then I took the Mooer Yellow comp (incredible). thank you very much. I wanted to ask you one last thing: do you know if my pedals order is correct? “guitar / mxr m 68 univibe / green russian big muff / Mooer yellow comp / tube driver (Radial) / Keeley Bd-2 / Mooer ElecLady / Nova Delay / Amplifier (fender hot rod de ville 2×12). Glad you find the tips useful :) The chain looks fine. Personally I like having the compressor first though. Thanks for the reply. I honestly thought that the univibe should be the first chain pedal (I did not know if to put it before or after the compressor …). Then I thought about putting the compressor behind the big muff and before the tube drive and keeley blues driver because it seemed to have read in one of your pages that the big muff became smooth and hot with a compressor or booster overdrive) put after and not before. I got confused – better before? do you also explain why? thank you! A compressor often sound better or is more effective when placed after the pickups. This way it will balance the straight signal from the pickups into the pedals. Keep in mind that even though you never use the compressor with the UniVibe and Muff, they will colour or bypass to some extent your signal even when bypassed. There are no rules. My best tip is always to experiment and try different combinations and positions of pedals. That’s pretty much the nature of the Big Muff. You should pair them with amps that has a bit of mid range, like Hiwatt or Marshall or a booster or EQ that can add a bit of mids. I haven’t A/B tested the two but based on memory alone I think the Green Russian has a tad more mids and presence. I picked mine up a little while back, and man, totally agree with you, the tone is HUGE and has a great sound no matter where you dial it in. I love the small box, and it sounds awesome in front of my Phase 90. I’m using a Jet City 333 JCA20H in my apartment and just fills the space. I’m loving this thing, I traded my tone wicker big muff for it. I’d love a Civil War or Ram’s Head muff at some point. But the Patriot may be my next fuzz I get. Depends on what you mean by “too close”… they’re both based on the same models and specs and I guess it’s down to the small nuances. The Patriot is perhaps a tad darker and more throaty sounding, if that makes sense. I like them both! Did you notice any differences between the Green Russian and the bass big Muff model or are they very similar? Thanks in advance and for all that you did! They’re based on the same original models and specs and as much as I like the Bass Muff, I think this one’s much closer to the real deal. It sounds more dynamic and open. I definitely prefer the Green. Do you think EH will reissue some kind of Rams head or violet Rams head?? I have no idea but I doubt it. There were just too many variations and inconsistencies back then and it would be hard to do a proper reissue. Not like this one anyway. We might see a ram’s head but I think the approach would be more like a boutique or clone, with a similar sounding tone rather than a true replica or reissue. Thanks for the review. So many variations of big muff creates a big mountain of choices and inevitable complex subject especially for people that canâ€™t afford. So it is a hopeful and clear path after reading your review. Would you boost the input or output of this muff? Normally boosting input makes it more saturated and compressed (reduces the dynamic expressions) so I suspect boosting the output is more useful. Cheers.